Last week, on the tenth anniversary, I was too emotional to post this, but I think I’m ready now. This is the story of what I went through on that day ten years ago. “They jumped. I saw them jump, and fall, all that way. They jumped,” the woman next to me says, her eyes frozen in stare, her face stone cold. All I can do is listen, as we ride up the island on the 1 train. She speaks softly and incessantly, a little bit like an insane person, and at first I don’t know if I should trust her. It’s the look in her eyes, though, that tells me she speaks the truth, and I begin to see what she sees. She hadn’t known what to do, when she witnessed the tower aflame and the people inside jumping out, so she decided to get back on the subway and go home. I’d done the same – boarded the subway to go to work. “What do we do?” I ask. “Wait for more information, I guess,” one man says. “I have to go to work,” says another. I do, too. I walk to the deli up the block for my morning coffee and olive bread. The owner has the television on, with live footage of the burning tower. I stand and watch it with him. “They say it was an airplane,” he answers. The broadcaster then says something about a private jet, must have gone off course, more information will be available soon. I pay for my coffee and bread and walk back toward the group of people on the corner, on my way to the subway. The East Village Mosaic Man, a crazy local who adorns neighborhood street lamps and traffic lights with mosaic tiling, has joined them. He’s climbed the corner stop sign and is spouting off lunatic claims about the Chinese. People tell him to stop. “Blame China!” he yells in defense. The thought of making it to work flies out of my mind; I have to call my parents. Utah is two hours behind – will they be awake? Will they know what is happening? I try a payphone, but service is down. I cross to the west side of the street where traffic runs south and try to hail a cab; they’re all filled and none will stop for me. I start running down Broadway, trying each payphone along the way. I stop in at another bar, and see on their television that Washington D.C. has been hit as well. Panic sets in. I think of my sister, who lives just a short drive from the Pentagon, and my parents who must surely be frightened – the cities that are home to both of their daughters have been hit. I need to get a hold of them, and of my sister. Running down Broadway, I shout at traffic going by. I board a bus, but it’s so heavily packed that it can’t drive at an efficient speed. The bus driver starts denying people entry, and asking people to get off. I again take to the street, and to waving down a cab. Finally, one stops for me. It already has a passenger – a young man in a business suit. He throws open the door. 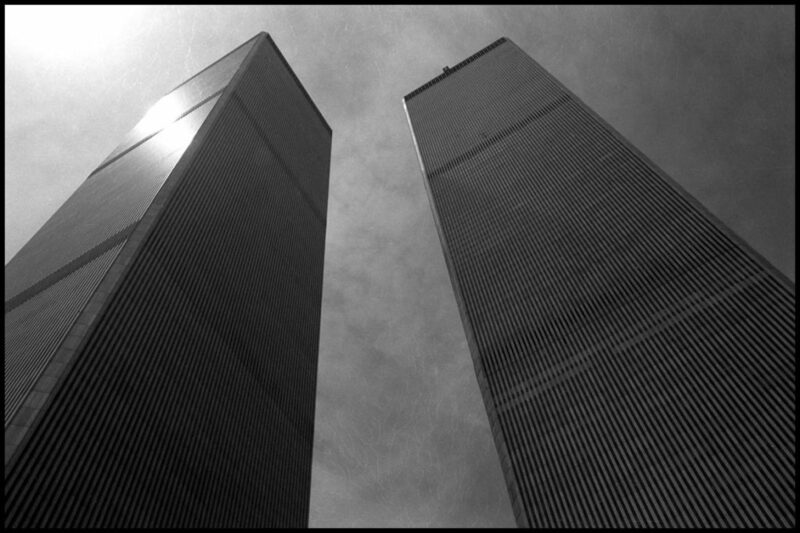 We sit in silence, as our cab driver tells us that his daughter, who lives with him in New Jersey, works at the Trade Center and had been running late to work that morning. He had advised her, against his character, to take the day off. He didn’t know why, but he didn’t think she should go to work today. He left her at home, while he got in his taxi. An hour later, she called him to tell him that airplanes had struck the towers. I run over to 3rd Avenue, and down into the East Village. I stop on the corner of 3rd and St. Marks when I see a woman collapse against a payphone. I ask her if she is okay, and I try to help her up. A few blocks later, I pass a businessman carrying a briefcase. He is completely covered from head to toe in white dust, and a thick layer of ash containing bits of burnt paper coats the top of his briefcase. He walks slowly, dispassionately, up the island, his moist eyes fixed on the distance ahead. My heart pounds as I feel, for the first time all morning, true panic rising within my chest. My cheeks quiver with a threat of endless tears. I run past a row of blue-shirted volunteers at a community center who hand out cups of water to passing pedestrians. While I, along with hundreds of other people, am entirely occupied with getting home, these volunteers are focused entirely on caring for everyone else. My heart swells with gratitude for my city, and the people in it. On Houston Street, a woman stops me, and, panting, tells me that we’re all going to get cancer from inhaling the debris. “You know we’re all going to get cancer, right? All of us!” she cries. She says she lives in Brooklyn and is afraid to walk across the bridge. “I don’t think so. Nobody has bombs today.” I try to assure her. I finally make it home, and my roommate, Maggie, is there. I’m relieved to be in her company, to have a friend to maneuver through this event with, rather than wandering alone among the crowds outside. We get in touch with our families. My sister is worried about my proximity to the attack, and the chaos on the streets. I try to assure her that I’m okay and that the streets are surprisingly safe, perhaps safer than at any other time. Security and community volunteers are out in full-force, we New Yorkers are watching out for each other. Maggie and I don’t have access to information in our apartment, so we decide to go up to a friend’s apartment on East 7th Street to watch his television. We stop at a deli along the way for some beer, and find the shelves completely empty. The store proprietor tells us he’s clean out; it’s been a busy night. We go, empty handed, to our friend’s apartment. He cooks risotto for us, and we spend the evening watching Peter Jennings on ABC News. His composure and paternal warmth gets us through the next several hours, and when his program ends and he signs off, I again feel a deep gratitude for my city and the people in it. As we walk home that night, we see that all streets below Houston, including mine, are under tight security. Residents have to show I.D. and proof of address to get past the barricade. We don’t have proof of residence on us, but the guard takes us at our word and lets us past with a stern warning to carry such papers on us at all times henceforth. I flashback to living in Russia two years prior, and I worry about what ramifications today’s attack will have on our civil liberties. For days, there is a thick white cloud enveloping my Lower East Side neighborhood, and a fine white powder upon every outdoor surface. The air is thick with the scent of burning metal and electricity. The streets are calm, and almost beautiful, like after a snowstorm, but there’s that smell . . . In these days immediately following the attacks, people mostly stay inside. Even the old Chinese man who sits on an upturned bucket outside the front door of his apartment on the fifth floor, wearing nothing but his underwear while his wife cooks on the stove range behind him, has gone inside. His front door stays closed, and I feel concerned for him. My sister has been calling, asking me to go stay with her in Washington D.C.; she doesn’t think I’m safe in New York City. I do my best to convince her that I’m very safe, and that I have an important new job to go to. My parents take up her cause and begin calling me on her behalf. I hold my ground, and remind them that D.C. was hit, too. Finally, my brother-in-law calls. “It’s for her sake. She needs you right now,” he says. I pack a bag, and the next morning I go to Penn Station to catch a train to D.C. I spend the next two weeks sheltered in the Virginia suburbs. Sylvia and I go into the city a few times, and one night we stop in at a Barnes and Noble. The cover of Time Magazine, an up-close image of the towers burning, shakes me up and I start crying in front of the magazine stand. Sylvia takes the magazine out of my hand and hugs me. “Don’t look. Let’s walk,” she says, and we go walking, arm in arm, around the neighborhood. I return to New York City ten days later, and finally begin my new job at Columbia. The people of New York have all gone back to work, have gotten the city up and running, and I’m proud to be part it. The gaping hole at One World Trade Center continues to burn, though, and the streets below Houston are still covered in a fine powder, and there’s still that smell. Now, ten years later, the odor of a building on fire, or a burning electrical line, has the power to stir up a dust storm within me. It contains sadness for the lives lost, and for that immediate unity of our nation that was lost in the political aftermath. It contains nostalgia for a Manhattan that doesn’t exist anymore – a Manhattan of surety and security. And it contains gratitude that my family and friends are still with me, and I with them, and that, through my reflections on that day, I have the opportunity to live a life with a little more purpose than perhaps I understood back then – the purpose of showing compassion toward not only my city, but my nation, and my world, and the people in it. On what was perhaps the worst day in our nation’s history, people came together to take care of one another. This, I now believe, is our singular purpose. Thank you for sharing this. Such sad circumstances but,its so beautifully written. As I was reading it I could feel the emotions that came with writing this. I myself am A fellow New Yorker. Although I was only 16 at the time of this horrid event, I still clearly remember everything. Once again thank you for sharing your story with us! So scary, I can't even imagine. It's very brave to post such a personal story, and you did it beautifully. Channing, this is a moving and amazing recollection of that horrific day. I am so grateful you shared it with us. I am a firm believer that those who tell the stories keep the people or event alive and prevalent. You are keeping those people, that event- the breadth of it all, in our consciousness and I so appreciate you for it. I remember watching the news at work and trying not to panic as I thought that you and Sylvia were in harms way. Waiting to hear from your Mom and Dad, knowing that they were in such fear for their daugters, my nieces. I am thankful that you and Sylvia were safe and still with us.